I cut my craft budget in July when I quit my day job as a newspaper reporter because I knew my new life as a podcasting, crafty freelance writer was not going to be as lucrative as getting a regular paycheck every week. And I thought I would miss having extra cash to spend on craft supplies, but I don’t. In fact, I’m having a great time creating with recycled goods and finding ways to repurpose vintage fabrics and old T-shirts. The T-shirts are my latest obsession. 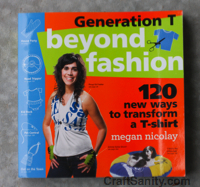 When I got my hands on a copy of Megan Nicolay’s lastest book, “Generation T: Beyond Fashion 120 New Ways to Transform a T-shirt,” I knew I was going to headed for some late-night crafting sessions. 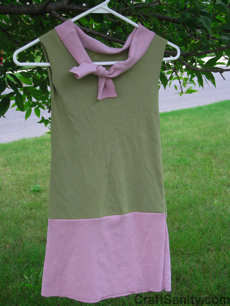 The follow-up to Megan’s first book, “Generation T: 108 Ways to Transform a T-shirt,” “Beyond Fashion” has inspired a new, recycled line of T-shirt dresses here at the CraftSanity headquarters. (I’ve made three so far, with more back-to-school fashions planned for my daughters.) Megan writes clear project instructions and provides detailed illustrations to accompany each project, making it possible for rookies to jump into T-shirt refashioning without getting lost. Where: West Side Garage Store, 351 Summer Ave. NW, Grand Rapids. Cost: $20 fee includes a copy of “Generation T: Beyond Fashion” book, a T-shirt and pair of scissors. Sign-Up: Call 451-4215 ext. 113. Enter to win a copy of Generation T: Beyond Fashion! The good news is you don’t have to be local to get in the random drawing for a copy of Megan’s book. Just leave a comment below about your favorite T-shirt craft below by Aug. 31. Good luck! I plan to interview Megan again for the podcast, so stay tuned. In the meantime, start collecting T-shirts in all your favorite colors. : ) You can read more about Megan’s T-shirt adventures on her blog. For today’s TV segment, I did a demo of the “Punk’d” shirt on p. 92 Megan’s first “Generation T” book and showed examples of “The Mod Squad” dress on p. 80 of “Beyond Fashion.” Simple and quick to make, these comfy dresses are a great way to give your old T-shirts a second wind. CraftSanity on TVGeneration TGrand RapidsMegan NicolayMich.recycled fashionT-shirt refashioningWZZM "Take Five & Company"
Susan – I love questions! Here are my asnwers!1. Granny smith apples all the way! Love them!2. I love cucumbers (especially when they are transformed to dill pickles!) I honestly don’t know the difference in the types.3. Tomatoes. I love any kind of tomato sauce and salsas. I like them cooked. I’ll eat tomato on a sandwich, but it’s nothing to get excited about.4. Bananas. They are so gross the texture. The smell. Yuck.5. I love veggies, but I guess my favorite would be grilled veggies.. .any kind even tomatoes.6. Sweet potato pie eh. Not really worth the calories if you ask me.7. French fries. How I love thee. I’m going to go with seasoned curly fries, with shoestring running a close 2nd.8. She’s my cherry pie . Head bang with me.9. I was a spoiled rotten kid that didn’t have to eat anything she didn’t want to. Although, I did have to try at least one bite.10.I don’t drink fruit juice or veggie juices. Waste of calories unless it has vodka in it.